Latisha Traver, Quenemo, stands on her porch in the 200 block of Seventh Street in Quenemo. The porch roof and a large garage behind the home were destroyed. QUENEMO—A cool and quiet first half of May erupted into severe weather throughout the Midwest last weekend, as a damaging EF-1 destroyed buildings in Quenemo, and a deadly EF-3 just across the county line left Reading in ruins. Severe weather sprang up Saturday evening, when spotters reported a wall cloud south of Auburn, issuing a tornado warning for northern Osage County and Shawnee County. The storm produced a long-lasting funnel that touched down briefly several times as it crossed Topeka and Perry Lake areas. The storm dropped hail on the center of the city, damaging windows and roofs. As darkness fell, a tornado was spotted two miles northeast of Emporia, headed for Reading. The smaller EF-1 twister stayed on the ground eight miles before lifting. Three miles later, it dropped again, staying on the ground for more than 10 miles along the BNSF track through Reading, eventually lifting near 269th at K-170, two miles south of Osage City. At one point, a second tornado paralleled its path for a mile as it passed south of Barclay. While on the ground, the EF-3 twister hit Reading with winds between 140 and 165 mph, knocking one home off its foundation, removing the top story of several two-story homes, snapping power poles, and causing significant damage to brick businesses on the town’s main street. Five of the city’s residents were seriously injured, and Don Chesmore, 53, died when the tornado flipped his mobile home. Chesmore’s obituary appears on Page 2 of this edition. A survey conducted Monday revealed more than $1 million in damage to both the commercial and residential sectors of the city - 26 of 110 homes were destroyed, 30 had substantial damage and are uninhabitable, and another 10 were damaged but considered safe to live in. Ten of the city’s 21 commercial buildings were destroyed, four were damaged and considered unsafe to enter, and seven more received some level of damage. Power and water was to be restored to working structures Tuesday morning, though a boil-water advisory remains in effect until further notice. Volunteer efforts for the city were delayed Tuesday as another round of threatening weather loomed over the area. The storm that struck Reading remained mesocyclonic Saturday evening as it passed just south of Osage City and Lyndon, reforming into a tornado along the south edge of Quenemo, where it took portions of the roofs off several homes, damaged vehicles and power lines, and destroyed two large barns and other outbuildings. Another larger multi-vehicle garage belonging to Jacob Knight was destroyed in the 200 block of South Sixth; a shed was flattened and the roof was torn off the home of John Wilson in the 200 block of South Fifth Street. His property had many healthy trees snapped at the trunk, and his truck had at least one piece of debris missile through the back window. Other branches appeared to have fallen on the car. Despite the damage, Quenemo residents were thankful for the help of friends, family and the community, and were glad to be safe. They knew the damage in Reading was much worse. 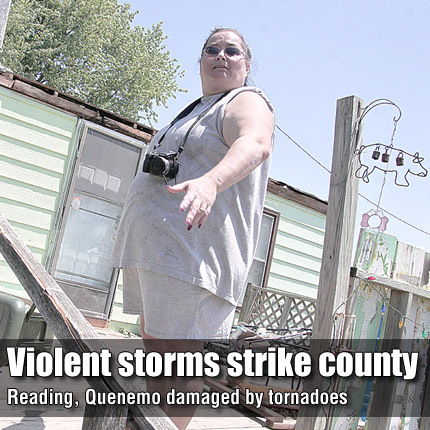 “If that tornado had hit here, this town would be gone,” said Quenemo resident Kim Caruthers, who gathered with neighbors at Wilson’s house Sunday afternoon, waiting for insurance adjusters to arrive and survey the damage. That sentiment was reinforced later that day, when another round of storms swept through Missouri, dropping a powerful EF-5 with winds in excess of 200 mph on the city of Joplin. The Topeka-sized community took what the metropolitan area to the north narrowly missed Saturday – a three-quarter mile wide tornado that destroyed a third of the community of 175,000 people. Joplin’s largest hospital was severely damaged; a Walmart, several schools and large sporting goods store were among the many unrecognizable businesses and homes. As of Wednesday, 125 were confirmed dead and more than 2,250 injured; 232 people were still missing. Tightwad Bank, of Reading, formerly Reading State Bank, will be temporarily relocating to The Osage City Medical Plaza at 131 W. Market in Osage City. The bank sustained damage, and shares a common wall with the Reading Post Office, which was destroyed in the tornado. “We want to reassure our customers their money is safe and insured,” said Cindy Koch, president of Tightwad Bank. “We hope to restore business in the next several days. The bank plans to operate out of Osage City for the next six months. They will anticipate forming a long term plan for their building and operations in Reading during that time. The bank is currently processing electronic transactions, utilizing a reciprocal disaster plan through another area bank, but will not have teller service until the Osage City branch is operational next week. Mail service for Reading is being delivered to the post office in Lebo. • The public may go to www.ksready.gov to make a donation to a voluntary organization assisting disaster victims in Kansas. • Text the word “ARMY” to 90999 to immediately donate $10 to the Salvation Army, who is operating a mobile kitchen to feed victims in Reading, or call (800) SAL-ARMY (725-2769). • Contact the Red Cross at (785) 234-0568. The organization is coordinating a number of relief efforts in affected communities. • A website has been set up at www.readingkansas.com, proving additional information on donations and volunteering. The site includes a page reporting the confirmed safety of residents of the community by name. • For more information on volunteer efforts, call the Lyon County Extension Office at (620) 341-3220.